"What a blessing, then, to own trousers which fit properly." 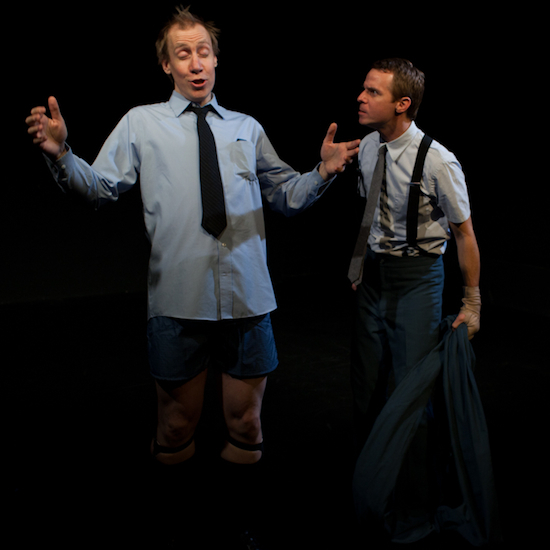 In March and April of 2011, The Straddler presented its second theatrical production, Trousers, by Dan Monaco, at IRT Theater in Manhattan. 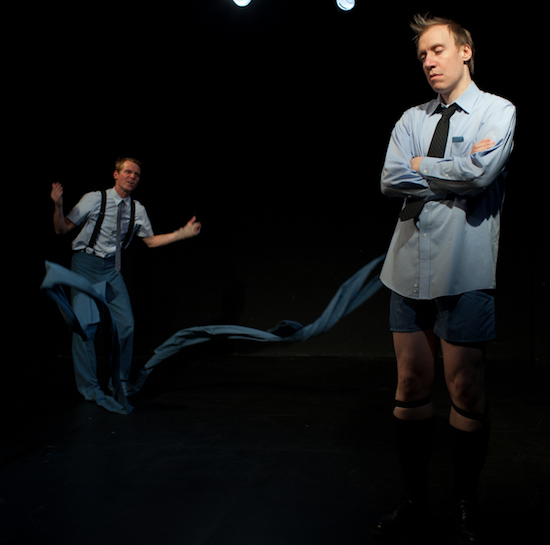 Trousers is a play about two men—one wearing a fifteen-foot pair of trousers, one not wearing any trousers at all—and the bruising conflict that ensues between them. Moving with balletic agility between considerations of the darker recesses of the human psyche and examinations of some of the more desperate corners of our society, Trousers is a comic tragedy about two deadly serious men engaged in a feverish and pitched battle over a question of grave consequence: just what does it mean to wear a pair of pants? The production featured Todd Pate as Man One and Marty Brown as Second Man and played for three weeks to enthusiastic audiences. About the Photographer: James Wrona is a New York-based photographer, primarily shooting people and landscapes, both rustic and urban. He is currently exploring a project assigning a visual value to images, addressing scale, repetition and spatial relationships.